There are literally hundreds of thousands of combinations of polymers and metals, with varying press fits and PVs, different tribological properties and tensile strengths. How do you choose the best bearing? 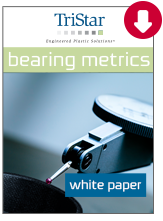 Our new technical guide will help you focus on the critical metrics to consider when sourcing a bearing for your project. Robots and bearing selection: which material is best for your industrial application? This guide explores how to overcome common bearing challenges in robotic design to deliver increased production. Learn the pros and cons of different bearing materials and explore eight industrial robotic case studies. Manufacturers: Ready to Improve Your Output? 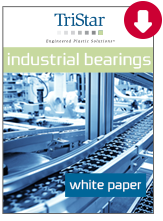 Get the Industrial Bearings White Paper to learn how! Industrial manufacturers are faced with rising costs and an uncertain future. Yet with the right bearing solution, OEMs and MROs can increase output and reduce downtime. 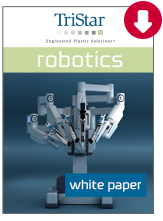 Get the manufacturing white paper to explore how self-lubricating plastics are solving top challenges in 10 manufacturing industries. From pesticide corrosion in agriculture, to bearing fatigue in the rail industry, plastics outlast and outperform traditional metals. From lubrication, to corrosion, loading and contamination, bearing failure is a common and expensive manufacturing problem. But it doesn’t have to be. 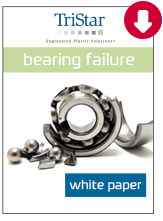 Get the bearing failure analysis guide to discover the primary causes of failure and top tips for preventing it in the first place. Not sure how to distinguish a sleeve bearing from a flange bearing or a journal bearing? Need advice on bearing selection, tensile strength or bearing vibration? 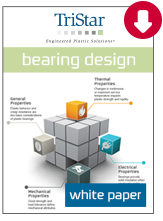 This bearing selection design guide is for you! 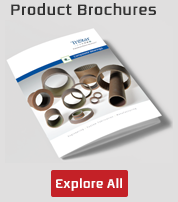 Download your copy to uncover top tips for matching the right bearing to your service requirements. Bearing selection has never been easier! 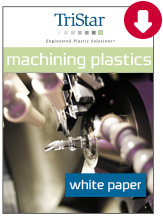 Plastic materials are challenging to machine. Unlike metal materials, they have a strong tendency to change shape and even melt during machining. 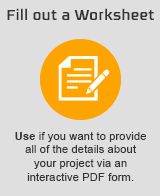 How can you avoid the pitfalls of custom plastic fabrication to make the most of your material investment? Get your free guide to discover proven techniques and best practices for machining the most-common plastic formulas. Rulon Bearings: How to Recognize Genuine and Avoid Counterfeit. 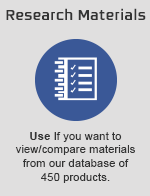 Download your free copy of The essential controls and tests required to predict industrial performance. Genuine Rulon® is a premium bearing material that excels in industrial applications. Yet there is a flood of low-quality, counterfeit “Rulon” materials being sold as genuine materials. 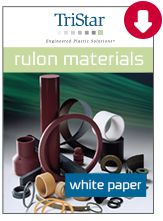 Our new White Paper helps you recognize genuine Rulon and avoid counterfeit materials. This follow-up to our first Rulon White Paper uncovers the controls and tests required to predict performance for industry, including medical, food processing, oil and gas, aerospace and more. 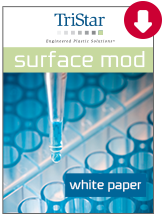 Surface Modification - Improve Adhesion, Micro-Clean, Functionalize, and Produce Biocompatibility, Hydrophobic or Hydrophillic Characteristics. Download your free copy of How Low-Pressure Plasma Treatments Can Benefit your Manufacturing Process. Did you know that by changing the surface energy of plastic manufacturing materials, you can increase the operating performance of your devices? Surface modification and plasma treatments give materials - including polymers, elastomers, metals, glass and more - a big boost in performance. Yet many designers are unaware of the many manufacturing benefits. 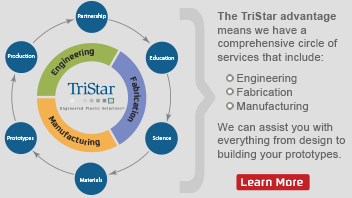 Look to TriStar for complete, in-house Surface Modification services, including surface analysis, plasma treatments, plus custom adhesives and specialty coatings. 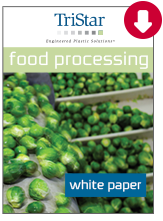 Download your free copy of Purity and Production in Food Processing: How Innovative Bearing Materials are Giving Equipment Manufacturer a Competitive Edge. The food processing equipment industry faces a litany of challenges, from escalating energy costs to evolving food-safety mandates. Manufacturers are striving to reduce the risk of contamination on the production lines, yet must also move perishables quickly from processing to packaging. How can manufacturers meet the dual demands of improving food safety and optimizing production? Discover how manufacturers in the poultry, bakery, dairy, and other food processing sectors are meeting these demands — and gaining a competitive edge — by replacing their metal and bronze bearings with composite and polymer materials. 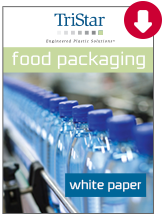 Download a free copy of Food and Beverage Packaging Equipment Manufacturers: Discover How Polymer and Composite Bearings Can Increase Production Rates – and Revenues. From bottling and canning plants to at-the-source packaging in the field, the food and beverage packaging industry has unique bearing requirements. And given rising energy and raw material costs, the industry also has a strong need to optimize operations. Read our white paper to discover how durable and value-driven composite and polymer bearings are making a difference throughout the food and beverage packaging line. Learn how these engineered materials provide production and savings benefits that traditional bearing materials simply can’t match. 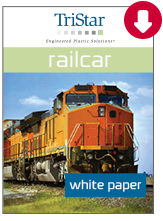 Download our Railcar White Paper to learn more about today's bearing options and benefits. Rail companies are demanding long-lasting and low-maintenance materials that will keep rail cars out of the maintenance yard and on the tracks. One solution is for designers to look beyond traditional building materials such as metal and steel, and explore the advantages of composite and polymer materials. From brake and caliper bearings, to servicing and right-of-way equipment-and even transit rub rails-polymer components are tracking advancements in rail safety, reliability, and efficiency. 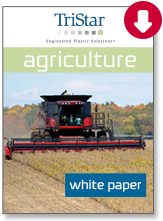 Download our Agricultural White Paper to learn more about today's bearing options and benefits. Historically, designers have specified steel or bronze for the many pivot points, assemblies, and cylinders aboard agricultural seeders, combines, tractors and other workhorses of the farming fleet. The belief was that metal bearings were durable and could handle the rugged terrain of a demanding farm environment. As time passed, lubricated bearings evolved, and what worked once is not applicable now. When only the performance advantage of Rulon will do for your application, how can you be certain of true quality? Which manufacturing controls should you look for to guarantee durability? And how can you choose from the 300+ varieties of Rulon to select just the right formula for your application? 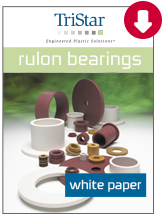 Download our Rulon White Paper to learn more about choosing the right Rulon bearing for your application.